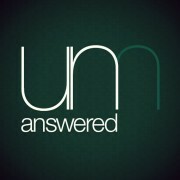 Communication breakdown on several fronts lead to this episode of Unanswered. The show was intended to be a discussion on the differences between loneliness and solitude, and the upsides to be found in the latter. Somehow the conversation stuck around an aside about introverts and extroverts. Additionally, the traditional recording set-up on Nick’s side failed, causing us to rely on the less than stellar Skype feed resulting in the occasional appearance of Robonick.